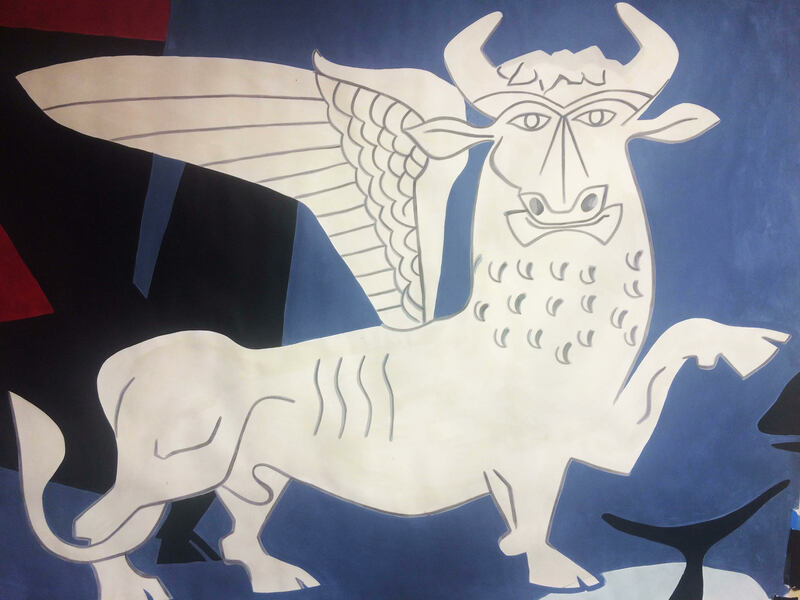 We are so please that after an epic journey to restore Peter Yates’ mural Day and Night,Winged Bulls, we can announce that the process is finally complete. Here is a sneak preview of the mural as it is today. For a more detailed understanding of how the mural has changed and how the fantastic team of conservators completed this project then take a look at the talk from Tom Organ who will talk you through the whole process. Everyone involved in the restoration process has been astounded at the results. The feel and the look of the original 1954 mural is shining through this work. You can see a gallery of more detailed images of the mural which we will be adding to as we take images. We are putting the glazing in place to protect the mural and then we will be celebrating the results with the residents and project team. Well done everyone. The Peter Yates’ mural at Bevin court has had a very exciting life, it’s been painted over twice and is now in the process of being restored. Along with the hunt to find the detail of the original scheme, there is also a tremendous amount of work being done to find out what the original colour scheme was for the mural. 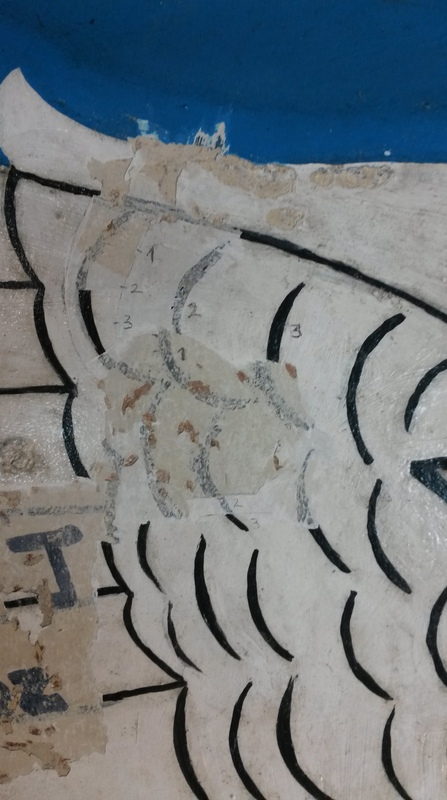 The conservation team sent samples of paint layers from the mural off to a lab to be tested. Through this the team discovered that the paints had a significantly different tone in the origional scheme. Tom and his team then match up all the colours and have produced swatches of the colours that will be used to reinstate the original look and fee of the mural. Take a look at the below image to see the difference between the colour painted pre 1989 and the original colour scheme. To the left of the image is the modern brighter colour blue. to the right is the more subtle, dusky 1950s blue. We think the finished produce is going to look amazing. 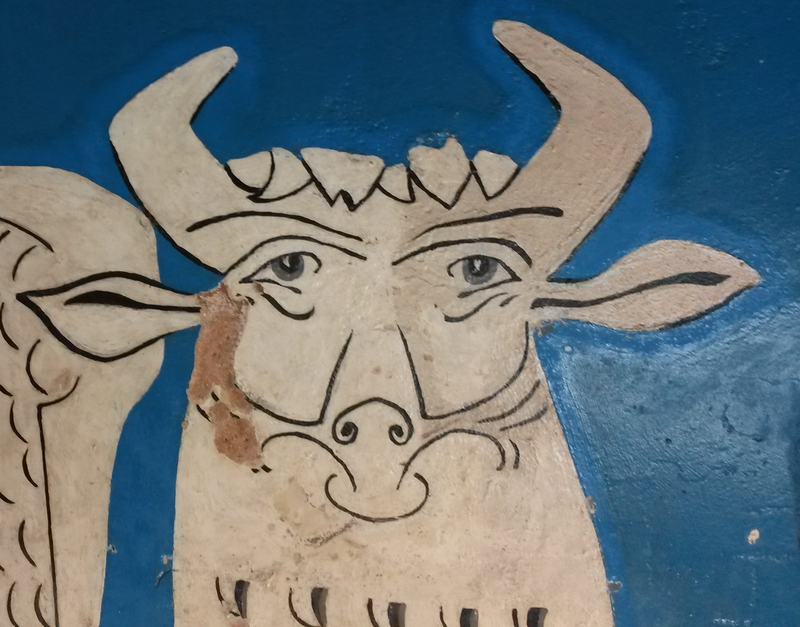 We are pleased to have sneak peak at the cartoon that Tom and his team have put together to restore the bull in Day and Night, Winged Bulls back to its original feel and look. After countless hours scrutinising old photos of the mural, looking at Yates’ sketches and other works. Tom has put together this majestic beast on paper and will transfer him onto the mural. We think he looks great and can’t wait to see him restored to his rightful place. 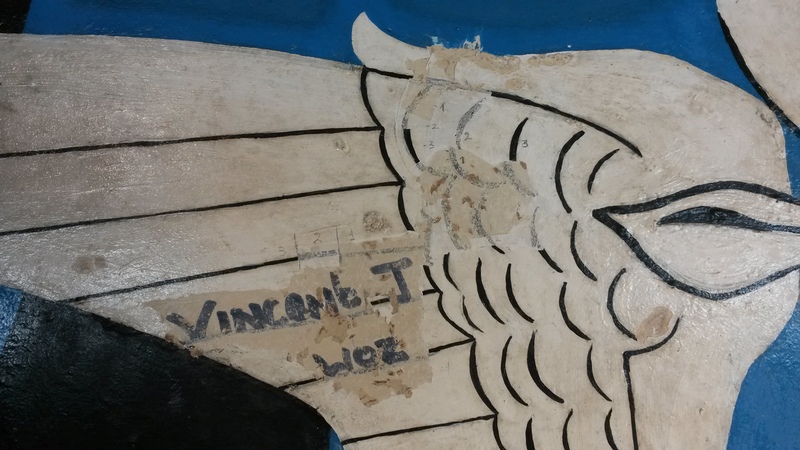 As we delve deeper into the history of the Peter Yates mural Day and Night,Winged Bulls we are finding some of the likely reasons why the mural was overpainted. Graffiti uncovered by Tom and his team gives us a much greater understanding of the life of the mural. Although none of the residents remember the mural being in such a bad state or repair, it clearly has had some significant vandalism. 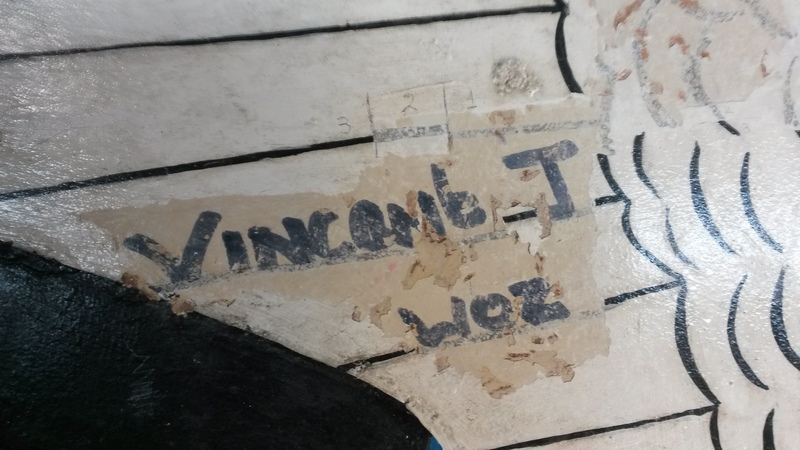 This gives us a motive for the overpaint that took place sometime before the 1980s. Another surprising aspect of the mural’s past is uncovered in this image. The top line of the bull’s wing has been drawn 3 times. This means there are three phases to this mural i.e. it has been overpainted twice! You can see on the below images that the conservation team have labeled the three phases 1, 2 and 3. Tom and his team have found that the first phase of the mural was completely whitewashed out although there is no evidence for the illusive missing wing on the bull. The second phase of the mural was abraded before the third was painted. 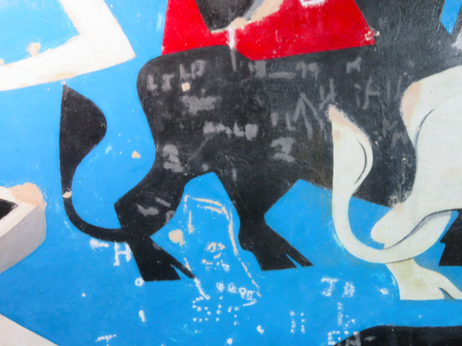 This could support the theory that Peter Yates could have painted the first phase of the mural with a two winged bull, painted the second phase of the mural with a one winged bull and then after a period of significant damage and vandalism, the mural was copied, abraded and then completely overpainted with the third phase some time before the 1980s. More graffiti was uncovered as the restoration process continued and the reasons for the overpainting of the scheme became more and more evident. You can listen to Tom Organ’s talk to find out how the team dealt with all this damage to the original mural. Breaking news: a Bull with two wings! 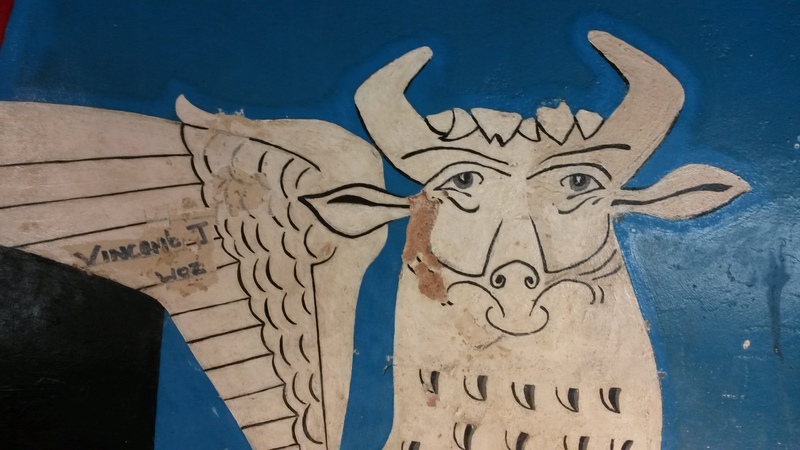 The Yates family have had a dig through their Archive of Peter Yates’ works and have uncovered some remarkable colour glass sides of the mural taken by Peter Yates. They are thought to be from before the building was officially opened in 1954. Indeed one of the photos is taken through the aperture where the bust of Ernest Bevin was placed for the opening in 1954. These amazing colour slides lead the project to two realisations. 2) when Peter Yates first painted this scheme, he gave the bull two wings! So far, the best photo that we had of the mural in the past was the photo that one of the original residents, Carol, gave us. She took the photo on 20 January 1989 and it shows the mural we know today in a good state of repair and not vandalised. The Yates’ Family Archive photos clearly show that there has been a wholesale over paint of Winged Bull Day and Night at some point between the opening of the building and the 1980s. The team have done some digging at RIBA archive too and found some photos of the mural taken by John McCann in 1954, the year that the mural opened. These photos are in black and white, but they clearly show that the same differences in the finish of the mural as shown in the Yates Family Archive slides. The main points of difference are in the detail of the Well, the Bull and a loss of detail in the buildings and the dolphins. Although surprisingly, the bull only has one wing as today – a mystery indeed! At this point in the project we had to discuss what route we could take with the restoration of the mural as we were clearly working with a later rendition of the work. Tom and his team walked us through the different options open to us, the residents and the family. In unison our team decided to try and restore as much detail of the original as we could. To this end the Yates family, very kindly, had the colour slides they hold professional scanned to retrieve as much detail from them as possible. RIBA too provided us with high resolution images of the images of the mural they hold. Tom and his team started studying the photos, cross sectioning the images to create a map of the original. They started to take some of the over painted top layers off the mural and we found some amazing evidence of the past life of the mural. The Yates family also scoured their achieve for studies and sketches of the mural and we compared these to the scheme. In many of his sketches for this theme, he uses a bull with one wing, but sometimes, the bull has two! The John MaCann photos of the mural are dated to 1954 at the time of the buildings opening. In these images the bull only has one wing. 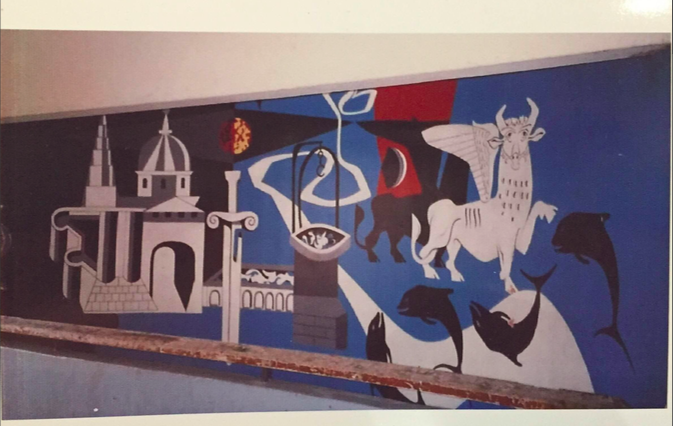 Therefore we can hypotifsise that Peter Yates may have painted the bull with two wings, photographed the mural and then changed his mind and painted the second wing out before the opening of the building. You can find out more about the process of restoring this mural by listening to Tom Organ’s talk on Restoring Yates. 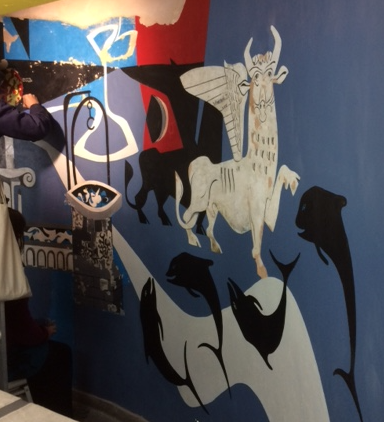 We’ve finally started the restoration of Winged Bull Day and Night, Peter Yates’ mural at Bevin Court. Tom and his team from Arte Conservation are working on cleaning the work up. The varnish that has discoloured the mural is coming off nicely and revealing a very bright coloured mural indeed! The evening of August 27 2015 saw Conservator Tom Organ from Arte Conservation team visit Islington Museum. Tom joined us to talk to the community about the mural at Bevin Court: Day and Night Winged Bulls by Peter Yates. Watch the video below to find out more about how he and his team will be conserving and restoring the mural. Peter Yates (1920-1982) was born in Wanstead, always artistic, he began studying architecture in 1938 at the Regent Street Polytechnic. In World War Two he was a fire watcher in the St Paul’s area and then went on to join the RAF on his 21st birthday. Peter Yates had a long term friendship with Berthold Lubetkin who he worked with on the Peterlee scheme. 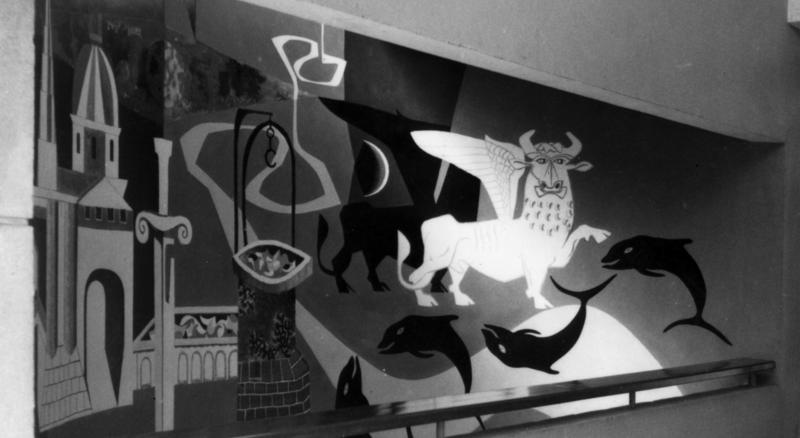 The mural painted at Bevin Court is named ‘Day and Night, Winged Bulls’. It depicts the coat of arms of Finsbury in an abstract form. The bold colours and mesmerising patterns make this a mural that you can really look at again and again. Finsbury, as a place, was an incredibly important construct to Lubetkin. As a borough, Finsbury had awarded Lubetkin some key contracts. 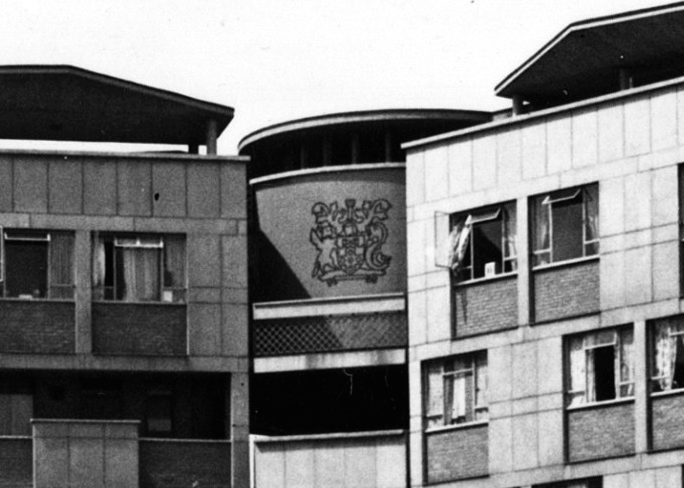 Three crests of Finsbury were once located at the top of Bevin Court. Sadly, when Finsbury was joined to Islington in 1965 the crests were removed. 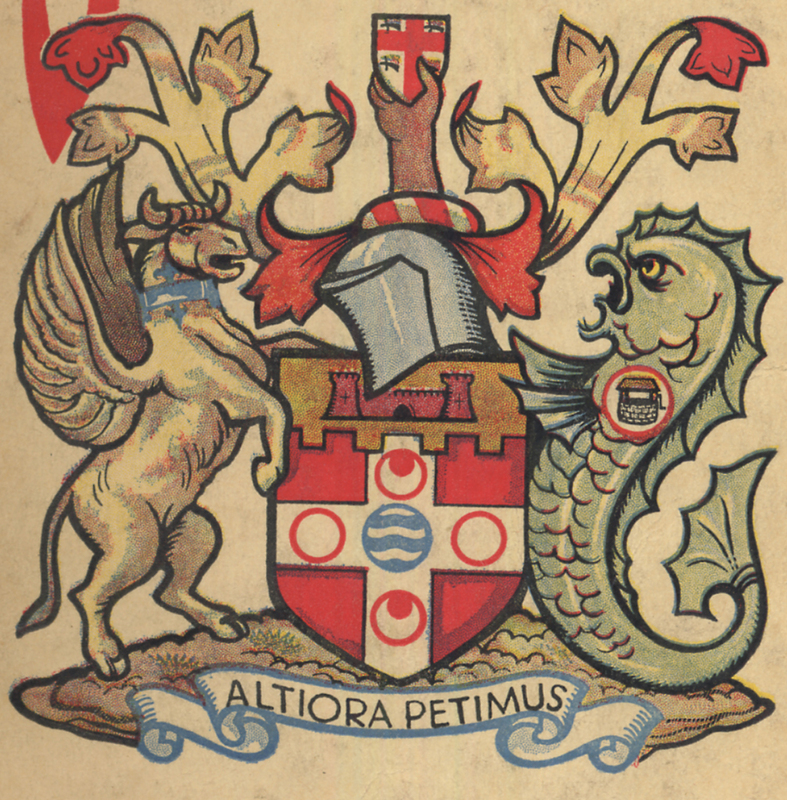 The crest of Finsbury was awarded to the borough in 1931 from the College of Arms. The following text comes from the Town Clerk Hugh Green in 1931. More can be read about the meaning and history of the Coat of Arms in our article on the Finsbury Crest and its meaning. Arms: On a red ground a White Cross, in the centre running water, with four red circles. Two plain and two charged with white crescents, the upper part of the shield embattled and bearing two towers and a gateway on a gold ground. Crest: on a red and white wreath a shortened forearm holding a small white shield bearing a red cross and four swords with gold handles. Supporters: on the right side (left to the observer) a Winged Bull in white, with a decorated blue collar, and on the left side a green dolphin charged with a badge thereon engraved a Well. the tower to the left is St Luke’s. Although St Paul’s is not in the crest it is the church which dominates the southern skyline when looking from Bevin Court. Looking at some of Yates’ earlier studies this is an easy progression. Take a look at Yates’ mural again and see if you can identify the parts of the crest. The mural has recently undergone a fantastic restoration process. To find out more about the process you can read these articles.